Join Us!!! We are looking for someone to help us cover WNBA basketball. Please send us an e-mail. Phoenix M. May.25 Seattle S.
Dallas W. May.24 Atlanta D.
Indiana F. May.24 New York L.
NEW YORK, NY - April 11, 2019 - The New York Liberty has acquired guard Tanisha Wright from the Minnesota Lynx in a trade deal that also includes the Las Vegas Aces and Atlanta Dream. The Liberty traded its second round pick in the 2020 WNBA Draft to the Minnesota Lynx in exchange for guard Tanisha Wright. In addition, New York traded guard Sugar Rogers to Las Vegas for the Aces' second round pick in the 2020 draft. The Aces traded forward Nia Coffey to Atlanta. 'We want to thank Sugar for her dedication to the Liberty franchise over the years,' said Liberty General Manager Jonathan Kolb. 'She gave her all night in and night out and we wish her nothing but success in Las Vegas. For the Liberty, the move brings home native New Yorker, Tanisha Wright, who was originally drafted by the Seattle Storm in 2005 and signed as a free agent with the Liberty in 2015. Last season, Wrightaveraged 4.3 points, 1.6 rebounds and 2.0 assists while shooting 38.3 percent from the field and 39.6 percent from long distance. The veteran guard is entering her 15th season as one of 10 players in WNBA history with at least 3,000 points, 1,000 rebounds, and 1,200 assists. LOS ANGELES - The Los Angeles Sparks have acquired guard Alexis Jones from the Minnesota Lynx in exchange for guard Odyssey Sims, Sparks Executive Vice President and General Manager Penny Toler announced today. The 5-foot-9 Jones was drafted 12th overall by the Lynx in the 2017 WNBA Draft. In a limited role her rookie season, Jones shot 38% on 3-pointers and 86% from the free-throw line. Jones started her collegiate career at Duke University before transferring to Baylor University where she earned All-Big 12 First Team honors her junior and senior seasons. Her senior year, she averaged 13.2 points, 4.7 rebounds, 4.8 assists and 1.2 steals per game while shooting 41.1% on 3-pointers. In return, the Sparks will send Odyssey Sims to the Lynx, who was acquired prior to the 2017 season in a trade with the Dallas Wings. Las Vegas Aces General Manager Dan Padover announced today that the team has acquired six-year guard Sugar Rodgers from the New York Liberty. In order to bring the 2017 All-Star to the Entertainment Capital of the World, the Aces first dealt second-year forward Nia Coffey to Atlanta in exchange for the Dream's second round pick in the 2020 WNBA Draft. They then traded that second round pick to New York in exchange for Rodgers. In acquiring Rodgers, the Aces improve their front court depth by adding a long-range shooter who has connected on 34.8 percent of her three-pointers in her career, including 36.6 percent over the last three seasons. 'We are excited about the addition of Sugar Rodgers to the Aces organization,' said Padover. 'We were looking to add another veteran this offseason who can help this young core move forward, and Sugar fits that mold to a T.
'Her ability to shoot from long distance will allow us to spread the floor, and she is a very sound defensive player. 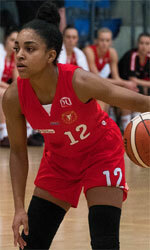 She is also familiar with our system, has a high basketball IQ, and will be a great teammate on and off the court. Although the Aces ranked seventh in the league in three-point field goal percentage a year ago, they were last in three-point field goal attempts, averaging fewer attempts than any team in the league since the 2013 Los Angeles Sparks. 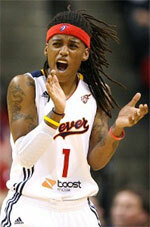 Rodgers was originally drafted by the Minnesota Lynx in the second round of the 2012 WNBA Draft. The New York Liberty, then helmed by current Aces Head Coach Bill Laimbeer, acquired Rodgers in a 2013 trade, where she remained for the next five years. The Georgetown grad enjoyed her best season in 2016 when she averaged 14.5 points, 3.7 rebounds and 2.4 assist, while connecting on 41.3 percent of her shots from beyond the arc. New York won its second of three-straight Eastern Conference regular season titles that year. She followed that up with an All-Star-worthy campaign in 2017, averaging 10.5 points, a career-high 3.8 rebounds, and 2.3 assists. Rodgers brings career averages of 8.0 points, 2.8 rebounds and 1.7 assists to the Aces, along with an 82.0 percent free throw percentage. Coffey was originally drafted by the San Antonio Stars with the fifth overall pick in the 2017 WNBA Draft. She began her sophomore season in the league by scoring in double figures in four of five games, but an injury at Chicago on June 3, kept her out of the next four contests. She returned to the lineup on June 15, but never quite regained her early season form.